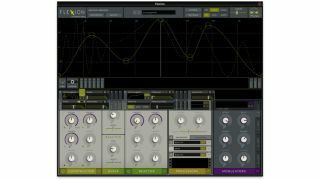 Flexion will operate both standalone and as a plugin. JoboMusic's Flexion is a new 'visual sound constructor' that's coming soon to Mac OS X and Windows in plugin and standalone formats. This will enable you to create oscillators, filters, modifiers, envelopes, LFOs and more "by constructing completely malleable shapes". These shapes can be altered using modulators and live controller input, enabling you to construct all manner of different sounds. Flexion is also said to be 'reactive'. "Configure an environment of scale-notes and harmonics that wants to be excited by frequency energy. Use the crossfeed from the oscillators and/or selectively apply impulses to fulfil that desire. Listen to the reaction that manifests itself somewhere between slowly decaying inter-modulating frequencies and percussive timbres," says JoboMusic. There's also that aforementioned visual element to Flexion - 3D backdrops are created that correspond to the sound, and you'll be able to share your presets and download others online. You can keep up to speed with Flexion's development by signing up to a newsletter on the JoboMusic website, where you can also apply for a private beta.